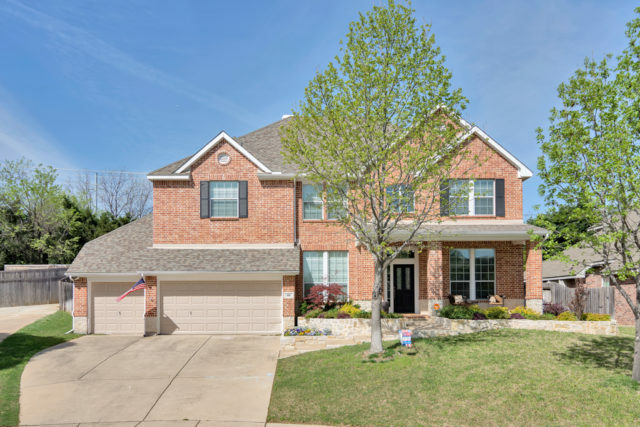 FANTASTIC home in desirable Silver Lake Estates neighborhood in Grapevine! 5 bedrooms, 3.1 baths, large 3 car garage with TONS of built in storage above garage doors. French doors for office in front of the house with nice sized closet, open floor plan with great flow from the kitchen, breakfast area and living room. Built in shelves in breakfast area. Master bedroom on first floor, large upstairs game room, and beautiful wrought iron spindles on staircase. Roof replaced in 2018 with Class 4 Lifetime shingles, water heater replaced in 2018, new stained back fence in 2019. Great space in backyard. Walking distance to elementary school, parks lake, hike & bike trails and downtown Main St!